It seems as if I have been in this line of work all of my life; growing up in the family businesses, obtaining an undergraduate degree in economics (aka supply and demand), and continuing through a series of my own businesses in the jewelry, art, and antique arenas. It is in these businesses and the real estate industry that I learned the importance of customer service. I have always enjoyed learning from teachers, curators, professionals, and scores of customers over the years, and I still do. A lifetime of learning and dedication to customer service composes the foundation of my business philosophy. The photograph above was taken at an educational seminar I attended on silver in July 2012. 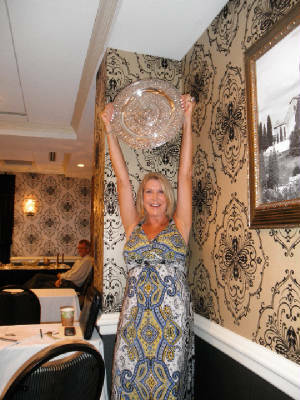 I was excited to hold this electrotype of the original plate used for the Wimbledon Women's Trophy, especially because my tennis team was headed to the playoffs. 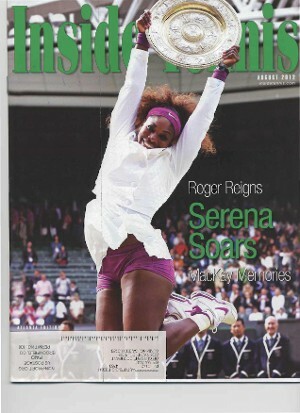 Just days after this photo was taken my "sister," Serena, appeared on the cover of Inside Tennis magazine holding her sterling silver version!